OMG had the best time this afternoon. A faithful reader directed someone to my blog who in turn contacted me. So in a reply I encouraged her to call and we would chat about her questions. Well let me tell you. We laughed and laughed, compared stories about our kids and talked about my favorite topic, making a christening gown! I am all about trying to enable someone else to do my favorite things, spend their $$ and create a gown. It was so fun to hear the enthusiasm in her voice as she forged ahead to make a sweet gown for her first granddaughter. I can't wait to see how it turns out. It made me want to go play with lace in my sewing room. You never know where a new sewing buddy will appear from. 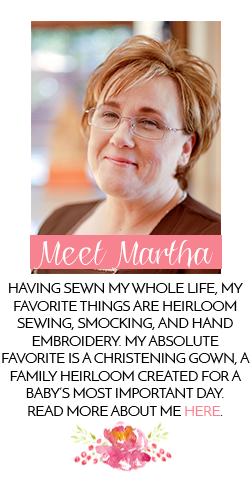 How wonderful that you got to connect with a fellow seamstress through another blogger! The circle just widens evermore. I hope she sends you photos of the completed gown & lets you share them with us. p.s. 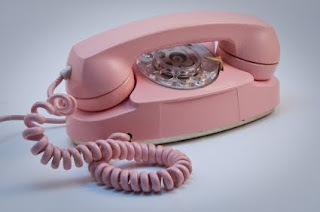 I always wanted a PINK Princess phone!!!!!!!!! I have been blessed to have some internet friends turn into phone friends. It really is such a small world. With long distance a flat monthly rate it makes it so easy. Martha, you have been more than helpful to me . . . you've inspired me and enabled me! Beyond my imagination! I thank Sarah for sharing your name as the source for beautiful gowns; I thank you in turn for sharing Jan's name. And it goes back around to thanking Carol for the opportunity for me to meet Sarah. This circle of sewing friends is a circle to be treasured! What respect and admiration I have for their unselfish giving of time and advice to help me in a momentous project. They've also invested confidence and that's priceless. That goodness will be felt when this baby wears this gown. She's blessed already. Julia, I can ALWAYS be counted on for a story, now whether it is completely true or not is something to be pondered. This one was as you can see below. Retta, I did too! I did have a clunky old black rotary one in my room for a while. Bunny I am amazed at the people I meet on the journey and to be reminded always at how small the world has gotten. Mary, you are most welcome. I can't wait to see the gown and the beautiful baby in it.